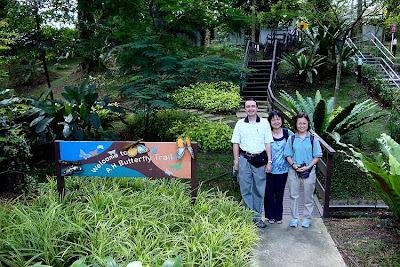 Over the weekend where Dr Laurence Kirton, his wife Yoke Lin, and his capable assistant from FRIM, Chooi Khim were here, they had a quick tour of some of our favourite butterfly spots in Singapore. As we were always short on time, moving from one place to another, and just making it for the Butterfly Conservation Dialogue at the Singapore Botanic Gardens on Sunday afternoon. However, a visit to Singapore by our butterfly guru would not be complete without a short stop at our urban butterfly-attracting gardens. Dr & Mrs Kirton and Chooi Khim had an evening tour of the Butterfly Garden at Hort Park on Saturday evening and also enjoyed the horticultural displays around Hort Park. We ended with a cosy dinner at the Kha Restaurant at Hort Park. Sunday morning saw us up early (that's 9:30 am for us butterfly enthusiasts!) and we headed out to Alexandra Hospital Butterfly Trail. The Kirtons were quite amused that our first stop was a hospital! But at the trail, the butterflies were already up and about, and Dr Kirton made some interesting observations on the variety of species found in our urban environment. A small patch of green next to a busy road can be an oasis for a good diversity with just the correct host plants. A pristine Common Imperial (Cheritra freja friggia) came down to play. 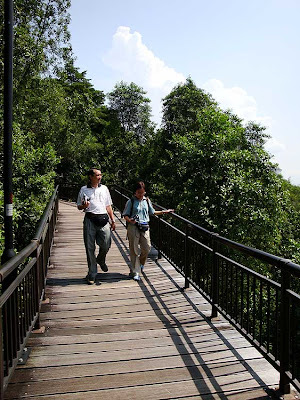 Our next stop was nearby Kent Ridge Park, and a quick stroll to the Canopy Walk. It was an enjoyable nature outing, and despite the lack of many butterflies, we still observed a handful of species, one of which is probably our commonest Nymphalidae, the Chocolate Pansy (Junonia hedonia ida) which was out in numbers. We had a discussion on the Common English Names at this juncture, and we also wondered why Junonia hedonia was given the name Chocolate Pansy, whilst the species found up north, Junonia iphita horsfieldi took the name Chocolate Soldier. 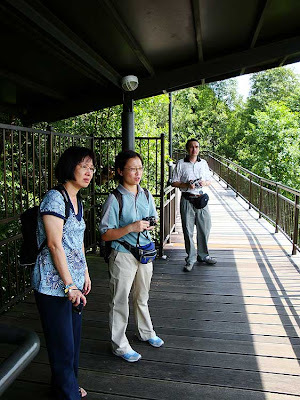 At the end of the Canopy Walk, and as if to say hello to our friends from Kuala Lumpur, the wine red Malayan Plum Judy (Abisara saturata kausambioides) flitted just on the aluminium railings just to tease our visitors. The morning walk ended quite nicely as we headed back to the hotel that the Kirtons were staying at, to freshen up. We then headed to the Botany Centre at SBG for the Butterfly Conservation Dialogue. The next day, Monday, we headed out to the Raffles Museum of Biodiversity, where Dr Kirton and Chooi Khim perused the Butterfly collection. 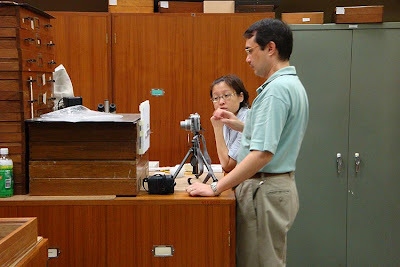 We were hosted by Ms Lua Hui Kheng, the person in charge of the zoological collection. 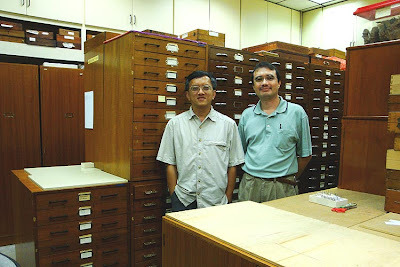 One of Dr Kirton's objectives was to study and compare the specimens of Stiboges nymphidia at RMBR's collection for comparison with the specimens taken in Malaysia. There were some observations on the physical markings of the species that could suggest the possibility of a subspecies occuring. The rest of us studied the numerous boxes of butterflies and helped to make revisions to some incorrectly labeled specimens. Also with us, were Dr Leong Tzi Ming and Dr Cheong Loong Fah, who were there to meet Dr Kirton for a chat. Dr Horace Tan also joined us later. After a full day at RMBR's butterfly collection and doing quick inspections of almost all the drawers of butterflies, we left, tired but satisfied that a relative bit of work was done. I also learnt a lot from Dr Kirton and Chooi Khim that day, and it was a good day of exchanging views and knowledge about butterflies. 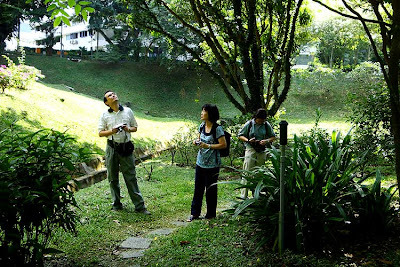 As the Kirtons left on Tuesday morning and headed back to KL, I thought what a little 'butterfly' hospitality from Singapore did to help our visitors enjoy their stay on our little island, and we got, in exchange, some knowledge and words of wisdom from one of the foremost authorities on butterflies in Malaysia.